Friday evening, Fox News’s Martha MacCallum interviewed Washington Examiner chief political correspondent Byron York. In that interview’s second half, the pair discussed new information which contradicts key contentions about “How the (Trump)-Russia inquiry began” made in a December New York Times story. 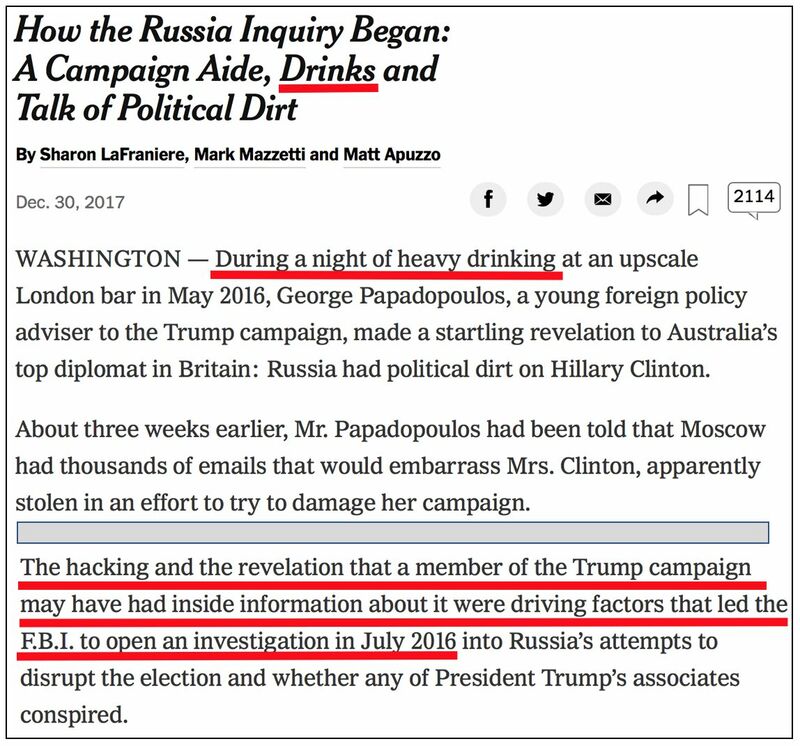 That story claimed that the investigation began as a result of a May 2016 “heavy drinking” meeting between low-level Donald Trump campaign foreign policy adviser George Papadopoulos and Alexander Downer, Australia’s top diplomat in Great Britain. That December 30 Times story, involving six of its journalists, is based entirely on four anonymous “current and former American and foreign officials” who supposedly had “direct knowledge of the Australians’ role” (strangely plural, despite the fact that Downer was the only named Australian involved in the story). 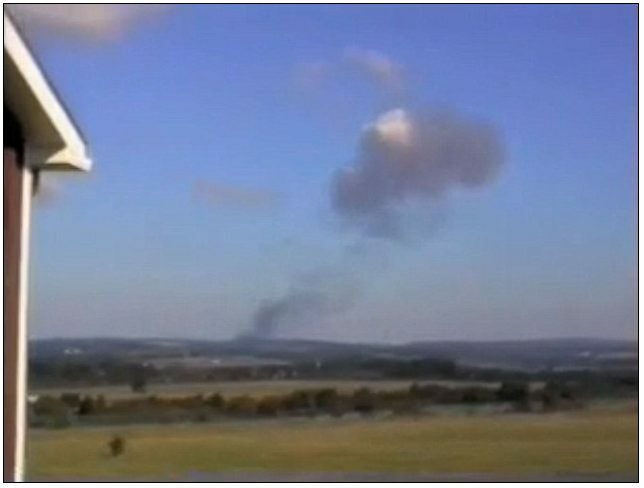 It appeared just as the Obama-era FBI and Department of Justice were coming under fire for appearing up to that point to have relied primarily, if not solely, on the unproven allegations contained in the infamous Steele dossier as the basis for opening its investigation into alleged Russia-Trump campaign collusion. MARTHA MACCALLUM: Alright, Kimberley Strassel wrote a piece today, and, you know, all of this gets very tangled, all these stories, right? But the point of this (Strassel column) is that the FBI, the investigators have said that George Papadopoulos’s discussion in Australia was one of the reasons that they started the investigation, right? MACCALLUM: And they said it wasn’t just the (Steele) dossier, it was also this, you know, conversation George Papadopoulos had. So that’s why she’s breaking this down. He talked about (MacCallum’s words) “Well, they might have some dirt on Hillary Clinton.” (Note: The Times story never quoted Papadopoulos as having used the word “dirt,” and Downer now says Papadopoulos never used that word.) But he was not talking specifically about emails, or thousands of emails that had been found. That’s a pretty big difference, isn’t it? YORK: Yeah, yeah, this is really fascinating. The scenario was that a man named Downer, who was the top Australian diplomat in London, had reached out to George Papadopoulos, as Papadopoulos, a low-ranking sort-of volunteer member of the Trump foreign-policy advisory team. 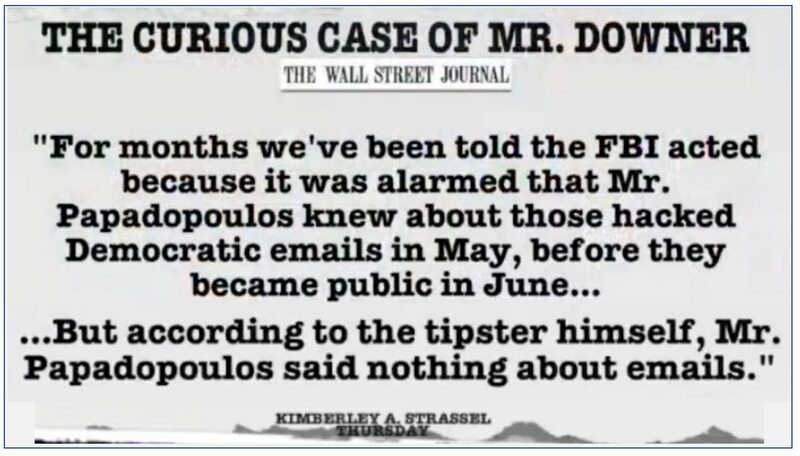 (He) reaches out, they meet, and the story is Papadopoulos is drunk, and he tells Downer about “the Russians have all these emails from Hillary Clinton,” (and) they might drop them in the campaign. 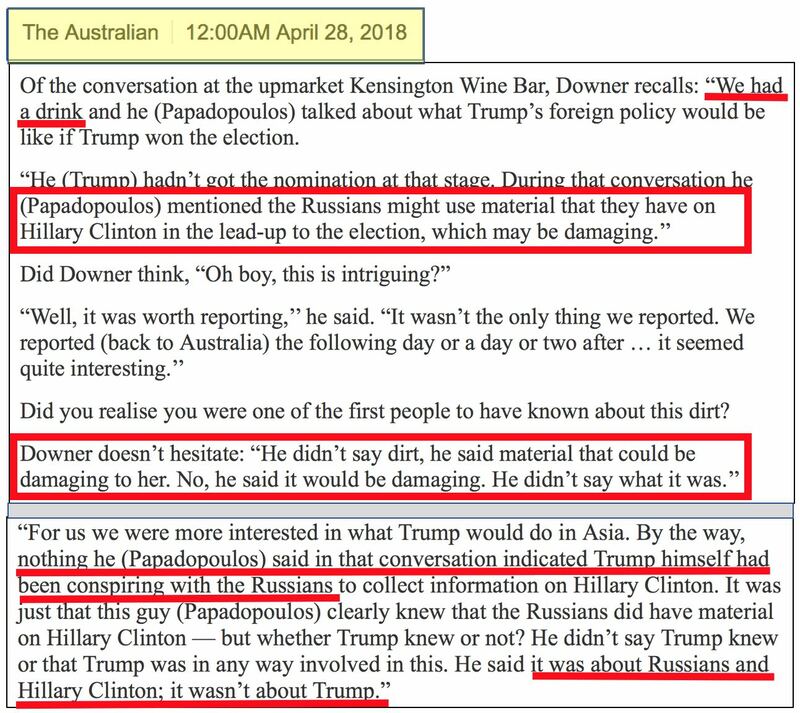 Well what has happened is, Downer has returned to Australia, and gave a long interview to The Australian, the publication down there, and basically said, “Well, nobody was drunk,” there was one drink consumed, that wasn’t a drunk thing, and he never talked, he Papadopoulos, didn’t talk about emails. So this has really raised a bunch of questions about the story of how this investigation has started. And by the way, no person in an official position has come out and just told the story. This was leaked to the Washington Post and the New York Times earlier, and now we’re getting new information about what those leaks were about. MACCALLUM: Yeah. I mean, if they lose the Papadopoulos part of the story, that’s problematic. The underpinning kind of starts to fall out. Because then you’re left with the dossier, and potentially, you know, some concerns they had about Carter Page, right? 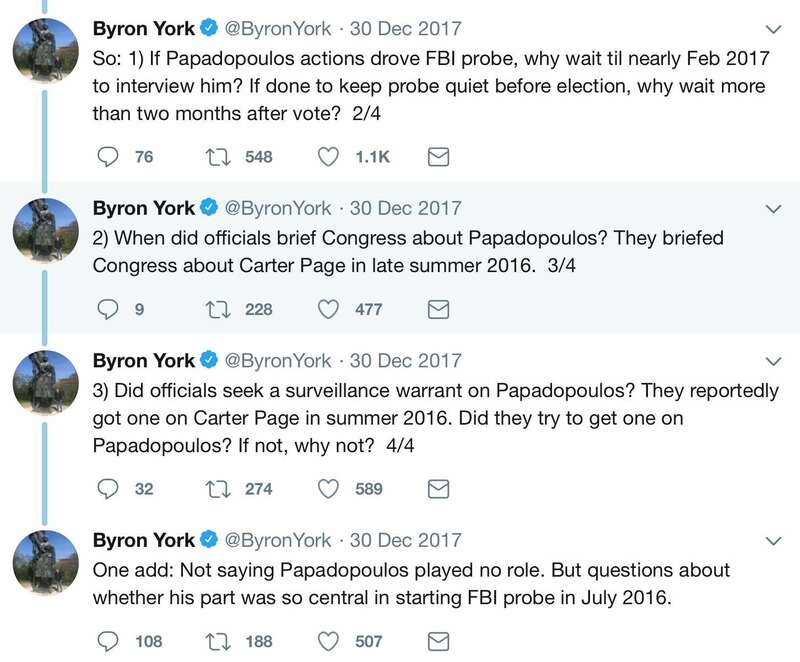 YORK: Yeah, the Papadopoulos story basically was leaked as a way to knockdown the dossier story. MACCALLUM: Yeah. You’ve done such brilliant reporting on all of this, Byron, and Kim Strassel has too. Thanks for all your hard work. Good to see you tonight. Given how significant these discrepancies are, it’s reasonable to believe that the anonymous leakers involved deliberately fed the Times very questionable and/or false information. It’s also fair to wonder whether the reporters at the Trump-hostile Times found the made-to-order story too convenient and useful to adequately check. 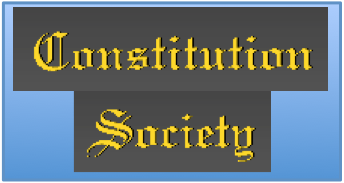 Cross-posted, with potential revisions, at NewsBusters.org.